Golf for Beginners believes in the importance of going back to the basics in order to refresh the fundamentals of the golf swing. Most players don't have time to continually visit their teaching pro whenever they feel their swing getting "out-of-sorts" so we rely on golf training aids in order to maintain a repeatable swing. The guest post below is written by Bruce Hubley, single-digit handicap golfer and inventor of The Slinger Golf Improvement System. Yet most golfers attempt to learn a golf swing with little or no knowledge of critical golf swing fundamentals. The pros I work with tell me that the percentage of golfers who take lessons is around six percent. Of those six percent, about fifty percent spend more time telling the pro what they are doing wrong then listening to what the pro has to say. That leaves around ninety-four percent of all golfers that have chosen to learn the game by watching TV, videos, DVD’s and reading magazines, etc. Good luck to that idea! At this point you need to ask yourself …Are You a Social Golfer Or a Serious Golfer? The Social Golfer plays golf to get out of the house, have fun and socialize with friends, with little regard to improving their golf game. The Serious Golfer wants to play better and will take the time, spend the money, and make the effort to become a better golfer. Okay, you’re a serious golfer. Now what? You have probably heard that the best way to learn a complicated body motion...and golf has plenty of them... is by repetitions…hundreds of them. But, repetitions are only beneficial if it is done correctly, otherwise they can be counter productive ….even harmful. So, how do you manage to make hundreds, even thousands, of correct swing repetitions without going broke at the local driving range and also be able to improve your golf swing, stay fit and “golf ready” year round, anywhere-anytime? There are many golf training aids on the market, so how do you know which one(s) to try? Portablility, the ability to use indoors, simplicity and feedback are most important when choosing a golf training device. One excellent way to hit hundreds, even thousands, of correct repetitions is with a portable, indoor-outdoor Swing Practice System. The Slinger Golf Swing Practice System includes a Velcro Target and six Velcro balls and the InsideMove. The Target has a Velcro stripe sewn down its center. This is what you try to hit, the same as a flag on the green. The portable Velcro Practice Target comes with six Velcro golf balls. Hang it on a wall at home, office, school, fire station, penthouse, anywhere. Grab your trusty wedge, or any iron and you’re ready to take charge of your swing and finally “Get It Right”. The InsideMove is an amazingly simple device that teaches a very counter-intuitive golf swing fundamental; how to swing “on plane” correctly. The InsideMove is placed on the floor and aimed at the vertical stripe on the target: it is a remarkable device that teaches you how to swing “on plane” like all the great pros and is the perfect partner for the Velcro Practice Target. Once the nickel drops, and you understand what it take to approach impact with the ball from “inside” the target line, a very counter-intuitive move…nothing will ever be the same for you and your golf game. It’s a true “Game Changer”. The Slinger is our most revolutionary product. It’s designed to be used indoors, it’s only 27” long, it fits in your luggage and goes where you go. It doesn’t touch the ground and never impacts a ball. It’s the perfect way to learn and master golf’s swing fundamentals. It’s a pure training tool, and by far your most important golf club. Now you have your own portable personal practice area that’s quick and easy to setup and use anywhere you go. More importantly, the visual feedback of the ball trajectory will tell you if each swing was done correctly or not. With this precise visual feedback you can self improve yourself to an excellent golf swing. At Slinger Golf we’re all about swing fundamentals the “road map” to a winning swing. With these products you will have the knowledge, and “knowledge is power”, to become the golfer you always dreamed you could be. You’re now a charter member of the five percent of all golfers who know what is takes to swing a golf club correctly. Yahoo! Bruce Hubley was raised in San Francisco and began playing golf at the tender age of twelve at Harding Golf Course, producer of many a great player including Venturi, Miller, Archer, and Lema. He caddied and was Captain of his High School and College Golf Teams. Soon after retirement as General Foreman of the San Francisco Water Department, Bruce decided to approach the game as an inventor, creating a golf training system that would teach fundamentals of swing plane and proper release. Seven years after visualizing his product and working with professional golfers and engineers, Hubley developed the patented “Slinger” training club and formed Slingergolf, Inc. Bruce also invented the patented “InsideMove”, to address the swing plane training issue. Together with Velcro Target System, all three training aids are a complete portable, indoor-outdoor, 24/7, Swing Practice System. 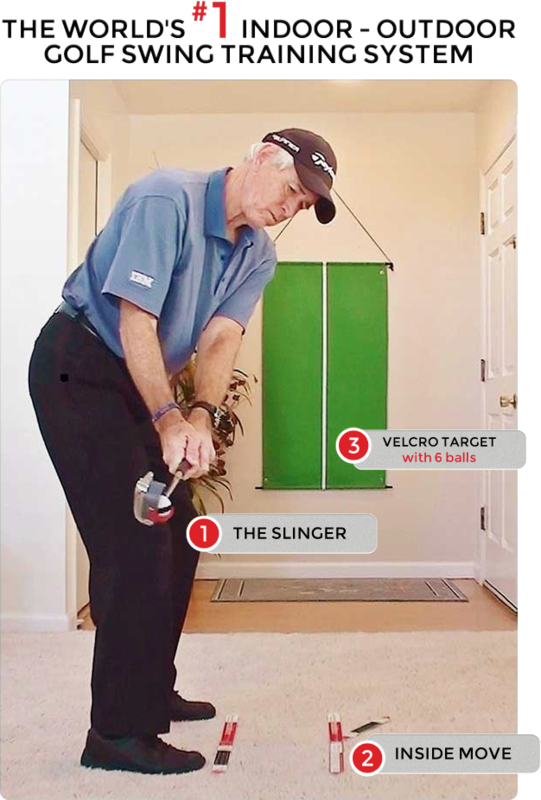 Do you have questions for Bruce about The Slinger Swing Practice System? Facebook: SlingerGolf ...and check out customer reviews of The Slinger on Amazon.com. As always, feel free to share your comments and questions on Twitter @Golf4Beginners and on our Facebook page too! Disclosure: This is a “sponsored post.” The company who sponsored it compensated me via a cash payment, gift, or something else of value to write it. Regardless, I only recommend products or services I use personally and believe will be good for my readers. I am disclosing this in accordance with the Federal Trade Commission’s 16 CFR, Part 255: “Guides Concerning the Use of Endorsements and Testimonials in Advertising. Links Between #Golf and Skin Cancer-Which Tour Players Had It? After receiving a golf press release about "Melanoma May" I realized that the probability of skin cancer during this season merited another blog which will probably sound more like a public service announcement! Here are the latest stats about skin cancer and the necessity of athletes, especially golfers, using a serious, water-resistant, broad-spectrum sunscreen. · 65% of melanoma cases are associated with exposure to ultraviolet (UV) radiation from the sun. · Men over age 40 have the highest annual exposure to UV radiation. · The majority of people diagnosed with melanoma are white men over age 50. · Melanoma is one of only three cancers with an increasing mortality rate for men. 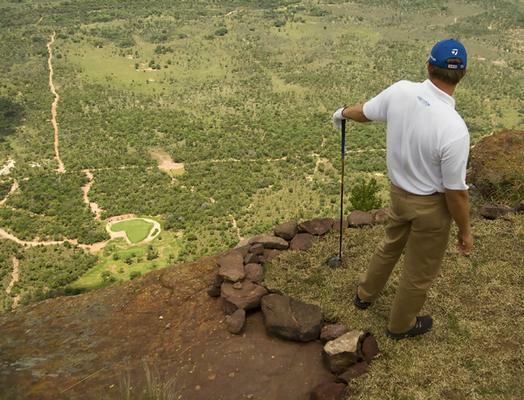 WHY ARE GOLFERS AT A HIGHER RISK? Other famous people who have had a brush with skin cancer include Senator John McCain, former President Ronald Reagan, Ewan McGregor and Bob Marley. To help prevent skin cancer, performance golf clothing is not enough! Doctors recommend applying a generous amount of water-resistant, broad-spectrum (UVA/UVB) sunscreen with an SPF of 30 or higher to all exposed areas thirty minutes before heading outside to play any sport. Look for a sports sunscreen formula that is designed to stay put if you sweat and won’t run into the eyes and sting, like the SkinCeuticals. No, I have not tried this particular sunscreen so I cannot recommend it personally. If my readers have tried it, I would appreciate your comments below. Bottom line is to protect yourself. Have a safe, healthy and happy Memorial Day weekend. Voice your opinion on Golf for Beginners, on Twitter @Golf4Beginners or on Facebook. Performance Golf Clothing that Keeps You Dry and Concentrating on Your Game! Spring weather can be very fickle for golfers who play in the rain; hence golf clothing must be functional and, yes, fashionable. Designed by golfers for golfers, Galvin Green waterproofs found at Function18.com can take care of the elements allowing you to concentrate on your game. Players are always looking for that extra performance tech "edge", whether it's in the golf clubs or training equipment, so why not utilize clothing to your advantage? Golf clothing now has to be functional, "providing exceptional comfort, freedom of movement and protection from the elements." 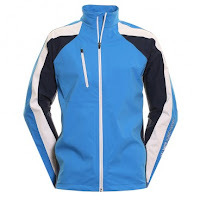 GORE-TEX highly breathable and waterproof Tech Fabric with stretch, tabs with easy touch and close fasteners, front and chest pockets with water-repellant zippers and even extra-abrasion resistant material if you carry your golf bag helps to turn golf clothing into necessary equipment during your round. Every year I have the opportunity to play Bethpage Black Golf Course and every year, like clockwork, it pours for the entire 18 holes...and I am unprepared. This year, according to the weather forecast, is no exception. I wish I would have seen the numerous accolades given to the Galvin Green line of golf clothing before I opted out this year. Today's Golfer, in their January 2012 edition, said Galvin Green was the “Best Waterproof Brand and Best Apparel Brand of the Year" with National Club Golfer (NCG) giving Galvin Green two thumbs up as "The Ultimate All-Purpose Suit." The "Alice" (above) in the Ladies Collection is waterproof and highly breathable and the "Beyonce" shell layer is a lightweight, windproof outer garment with temperature regulation. Warm, cool and base layers will keep your body comfortable during that all-important golf tournament. Mens Galvin Green Acton GORE-TEX® Golf Jacket. A waterproof, full zip golf jacket in GORE-TEX® Paclite® stretch fabric. Extremely hard wearing and long lasting, easy to wash and maintain. Mens Galvin Green August GORE-TEX® Paclite® Waterproof Golf Trousers. 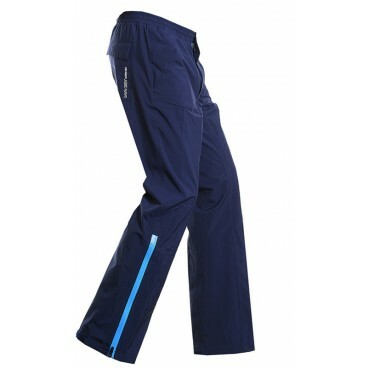 Waterproof golf trousers constructed from GORE-TEX® Paclite® Technology fabric, an ultralight fabric allows maximum breathability by releasing excess heat and moisture, whilst keeping external elements at bay. Check out the entire Galvin Green Golf Collection at Function18.com as well as the Masters Collection. How do you purchase golf clothing ...with function in mind? Golf World Tour - The Craziest Courses in the World! No two golf courses are alike, which is the subject of this guest post from Stewart Probert. Different ways of achieving par, complex settings offering architectural and geographical choices and the types of challenges faced along the way leave a myriad of options for golf beginners through to players who want a considerable competitive edge. Enjoy this article and feel free to leave your comments below. About the Author: Stewart Probert from Sweetwoods Golf Club in East Sussex, is a keen golfer, traveller and writer. When not taking chunks out of his local course and/or throwing clubs into the trees, he can usually be found reading and writing about sports, anywhere that anyone will let him! One of the things that makes golf unique amongst most sports is the fact that no two courses are ever the same, making every round of golf a potentially new experience. But with thousands of golf courses around the world, it takes something that little bit special to stand out from the crowd and entice players from all around the world. These are a few of those courses who have gone above (way above - literally in some cases!) and beyond to provide anyone gracing their greens with a truly unforgettable experience. The Legend Golf & Safari Resort it most famously known for the “Extreme 19th’ - a par 3 hole that begins 400m above the Africa-shaped green on Hanglip Mountain, and requires a helicopter just to reach it! Numerous notable figures have come to play the Extreme 19th, including celebrities and well known professional golfers, although it’s notorious difficulty means that making par is something of a feat. The Legend Resort even keeps a “Leaderboard” of lowest scores for the hole on their website, peppered with a few names you’ll recognize. There is much more to the resort than its 19th hole however: the 18 holes that make up the ‘Signature Course’ have been designed by 18 of the world’s top golfers including Colin Montgomerie and Sergio Garcia. Meanwhile there is also the tribute course - a 10 hole stroll through golfing history that features the best par 3 holes from courses around the world including Pine Valley, Augusta and the Old Course at St Andrews. It’s like a whistle-stop golf world tour! Elevation is a vital ingredient when it comes to a good golf course, but when that course is already 3,318 metres above sea level, perhaps it isn’t that important. The La Paz Golf Club is the world’s highest golf course, and as a result you’ll notice that those balls travel that little bit farther - or maybe you just perform better when thousands of metres above the sea? 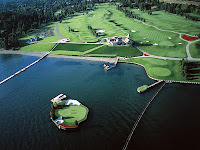 Many golf courses are known for their treacherous water hazards, but the 14th hole at the Coeur d’Elene Resort is unlike anything you’ll have had to negotiate, as this hole has a floating green in the middle of Lake Coeur d’Elene. The moveable floating island green is currently the only one of its kind in the world. While getting on to the green may be difficult, at least you won’t be faced with a dilemma about whether you should take the easy or difficult route. Although landing your ball on the green might be tricky, you can get there yourself quite simply at least with a short boat ride. Imagine playing golf in the lush surroundings of a tropical island and you’ll begin to imagine what Le Touessrok is like. Just a couple of hundred metres out from Mauritius, the course is surrounded by crystal clear blue waters and an abundance of plant life. If there’s any course on earth where you’re going to be coaxed into enough of a tranquil, content state of happiness by your surrounding scenery that you’ll forgive yourself for missing a 2 foot-putt that ordinarily would send you into a club-throwing tantrum, this would definitely have to be it. Have you ever hit a ball so hard and so far that it raced into another time zone? Play a round at the Tornio Golf Club (which is officially in Finland) and you’ll be able to say you have. The course straddles the border of Finland and neighbouring Sweden allowing players to blast their ball back and forwards across time zones and national borders until they feel like Marty McFly himself. Now if you’re late getting back from the clubhouse, saying that you didn’t know what time it was will be a perfectly valid excuse. 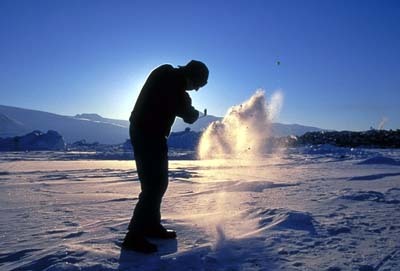 The World Ice Golf Championships have been held annually in Greenland since 1997, but only as long as conditions have been acceptable. After all, playing golf on this extreme landscape of Uummannaq is dangerous enough as it is. If you thought trying to contend with bunkers was difficult, perhaps you should consider how you’d cope with wind chill, or just how you’re supposed to land your ball on a green that is actually white. Golfers that have been lucky enough to play a round on this unique course have claimed that the stunning scenery is more than enough to distract you from the freezing temperatures. We end our world tour where we began in South Africa, at a course that borders Kruger National Park. While fantastic scenery is guaranteed you never know what wildlife you might see, so keep your eyes peeled for giraffes, hippos and rooibokkies. So there it is, the world tour with a difference. While golf has long been thought of as a traditional and conservative game, as it becomes more mainstream and more golfers look for unique experiences, it’s likely that the number of courses offering something novel will increase. One course attempting to push the boundaries to a new, debatably insane level is the incredibly bizarre new course under construction at Mission Hills in China. Most simply described as a giant crazy golf experience, the course aims to bring the novel charm of crazy golf with its colourful, zany obstacles to life in the form of a full 18 hole course. 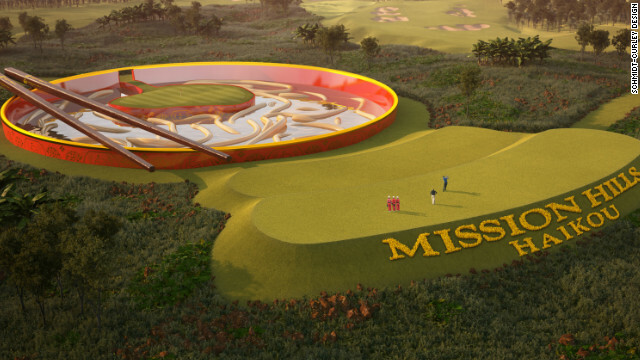 With proposed hole themes including a floating green in a giant bowl of soup (complete with huge noodles and chopsticks! ), one hole utilising the Great Wall of China as a hazard and one with a fairway straight through some Mayan Ruins, the Mission Hills course certainly sounds like one to keep an eye on! Voice your opinion below, on Twitter @Golf4Beginners and friend on Facebook. Big Break Mexico Golf Channel Premiere...Arriba! For golf fans who simply cannot live without watching a season of Big Break, the wait is finally over. The new season of BB hails from IBEROSTAR Playa Paraiso Golf and Spa Resort in Riviera Maya, Mexico with a GQ factor of 10-plus. Will a budding Tiger Woods or Annika Sorenstam emerge from this group? ...and BB is here to offer up a slew of prizes as well as to advance them to that next rung on the ladder of success, namely, a gig to play a pro tour event. A female winner gets invited to the 2013 Lorena Ochoa Invitational Presented by Banamex and Jalisco and, if a male wins Big Break, expect to see him competing at the Mayakoba Classic. Stefanie Kenoyer who, at twenty-four year old, is a full-time competitor on the Symetra Tour. McKenzie Jackson had four top-tens on the 2012 Cactus Tour. Liebelei Lawrence who was a two-year member of the Ladies European Tour and who tied for 27th position at the Omega Dubai Ladies Masters Tournament. Each of these golfers has an "impressive golf resume" as opposed to season 2003 Big Break participants who were chosen by open audition with prerequisities of a "scratch" handicap and demonstrative proficiency with various types of shots. Personality, of course, also had to be "engaging" to the viewer as Jay Kossoff, 2003 Senior Producer of Golf Channel, once said, "positively or negatively"... which still applies for all television shows. And yes, a good story still sells; Jason Seymour's story should bring a tear to your eye. That being said, take a gander at the cast of Golf Channel's Big Break Mexico and make sure you tweet your thoughts during the season using the hashtag #BigBreak to @Golf4Beginners. 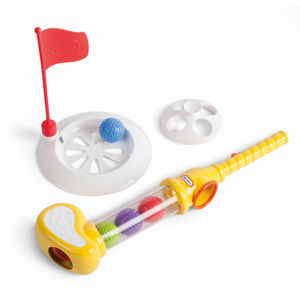 Is it really that difficult to get your kids to try...and love...golf? In a Golf Digest article, Johnny Miller said that the most important thing you can do to get your kids involved, and remaining in the sport, is "unadulterated praise. When your 7-year-old hits a good shot, say "Great shot!" When he hits a bad shot, exclaim, "Great swing!" Bob Rotella mentioned that you shouldn't necessarily teach the child but instead, let the kid teach you! Most importantly, Mr. Rotella explained that, "the best thing you can do is show your kids what a great time you're having. If they see you having a wonderful time, then chances are they'll have a good time, too." Make golf fun for kids and in turn, they will want to see what all of the excitement is all about! 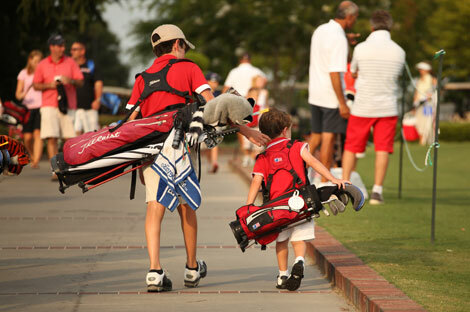 David Bryce, a contributing writer to Golf for Beginners, has decided upon five points he believes necessary to engage and encourage children in the sport so that they find it a positive experience. It wasn’t as hard to do as one might think. In fact, it wasn’t difficult at all. I’ll tell you the secret right now. It was all about the environment. In short, it was positive and fun. I let the kids like it on their own terms and not mine. While each experience with undoubtedly by different and unique, there are things that can be done to help foster a love of the game. Start young. I hear this regularly from many other parents and pros. Starting young will help them develop skills as a young mind is a sponge ready to soak up information. Granted, introducing a young child to golf takes patience, it can prove to be well worth it. With a young child, say three, four, or five years old, the best thing you can do is give them a golf club (preferably one more their size) and a ball to hit around the backyard. Avoid the TV. At first, anyway. I mean this twofold. This is a point a few of my friends like to argue with me on. While I’m sure there are a few kids really enjoy to watch golf, it’s generally after they have a grasp of what’s going on. The best way to get that grasp and understand of the game is to play it firsthand. My second point is video gaming. There are a few golf games out there and even fewer that are genuinely good. You can’t learn to play with a controller, even if it is motion sensitive. In my experience, due to the simplicity of the gameplay, the games can give a false impression of the game both in terms of physical environment and personal ability, especially when you’re trying to learn the game in the real world. These games lack weight, gravity, and in many cases, a sense of reality. Once a child has a grasp of the game, then yes, it’s a good idea to watch professional matches on TV (and in person, if possible). They can see how these players interact with the course, how they hit the ball and how they concentrate, plus they’ll probably land on a player who they’ll idolize and want to emulate, and emulation is an excellent learning tool. Get out and play. Go to a practice green or a driving range, or both. When you’re there, focus on showing and not telling. Let them observe you and others, then let them have at it, in fact, the soon they’re swinging the golf club, the better, since watching someone else enjoy something is exceptionally boring. They’re not going to be perfect on the first, second, or twenty-fifth swing, but they’ll gradually improve. Your goal is to let them discover the love of the game for themselves, so take a step back (which, when they’re swinging, you and everyone else should be a few steps back). Nothing is more satisfying than the feeling of the head of the club comes into contact with the ball and that ball is sent soaring. Kids learn that one fast. Work on form. Once kids have a feel for absolute basics, you’ll likely have to intervene a bit to work on their form. Yes, you can get a golf pro or register them for classes, but it’s good to start off with a familiar. However, this is where observing pros play can be beneficial. Emulation is great for working on form. Kids will likely need assistance getting into various forms, but don’t let yourself become a rusty pair of training wheels. Again, focus on fun. Hit the golf course. Take them to a municipal or similar course where their talents won’t be judged and the patrons are more likely to have more patience. Let them play golf on their own terms, but encourage them to use the skills they have picked along the way. They’ll quickly discover the more they use those skills and the better their form is, the better their performance will be. Have a fun time, cheer them on and shower them with praise when hit a good shot. Want to read more by David Bryce? Read: Should Golfers Have to Pass an Etiquette Test?